Putting your TV on the pole. Evidently, Ikea at one time sold a shelf panel that could be aligned vertically and used as a mounting plate for this very purpose. They don’t have any part like that available in their current catalog. I would almost assume that with the larger and larger TV’s coming, out, there may have been concern over the strength of their typical pressed wood shelving material. (Opinion only.) This “Ikea hack” actually hooks the TV to matched cross bars to better support the weight. We saw a very similar use of this model that just mounted a standard plasma TV mount directly to the pipe cross bars using hardware store U-bolts. The Ikea product in their catalog is the “Stoleman” system. If you were really ambitious, you could always adapt some galvanized pipe to do this, using either fence pole hardware or even some T-joints. But the Ikea stuff works great; they have additional shelf modules, cross pipes, etc. that you can use or adapt to hold hear, hide cables, or store media. 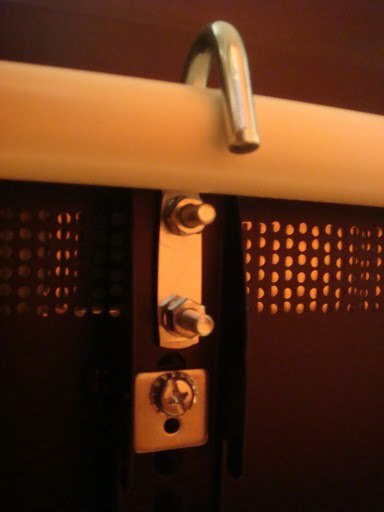 hardware hooks to hold TV onto crossbars. Another idea we had to enhance this. Either on that same pair of cross bars, or another single crossbar piece, you could u-bold some pegboard on and have a great place to manage wires, tie-wrap adapters and wall warts, and power strips. This would enable you to hide a ton of wiring that would otherwise drape down from the pipe pieces. One other variation, we even saw one group adapt a flat screen mount to fit a single pole. This enabled the panel screen to pivot when needed. 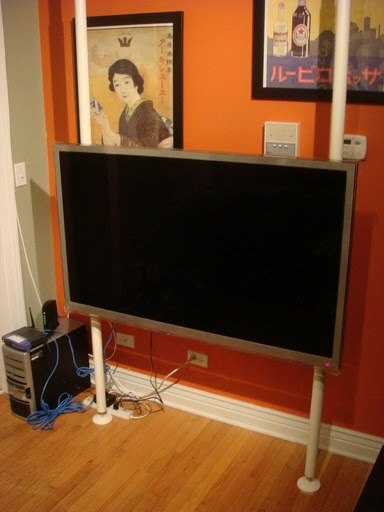 With this fairly inexpensive, pre-fabbed system, you can adapt a pretty substantial flat panel TV mount on a piece of pipe.